The photos below are from the Rolfe High School 1970 RAM yearbook. 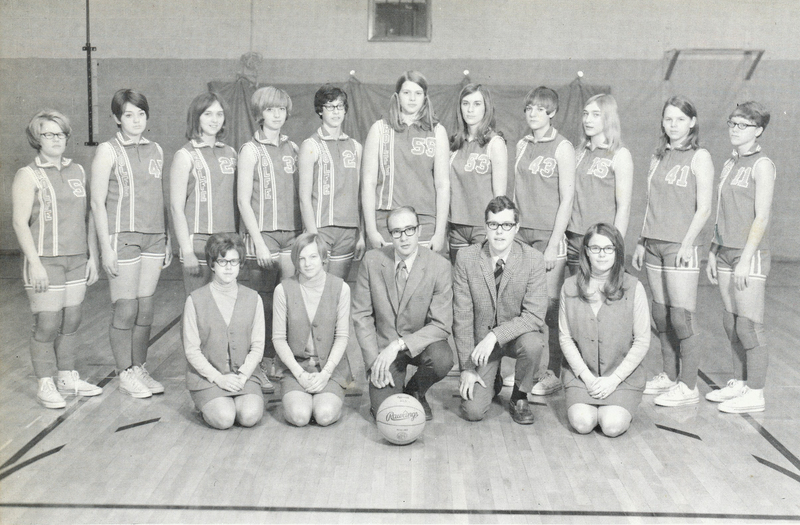 1970 was one year before the Rolfe girls’ basketball team played in the state tournament. As shown below, in 1969-70 Rolfe had a less-than-500 record. I’m not sure, but I think that might have been the case for every Rolfe girls’ basketball team since Rolfe girls’ basketball was reinstated in 1959-60. 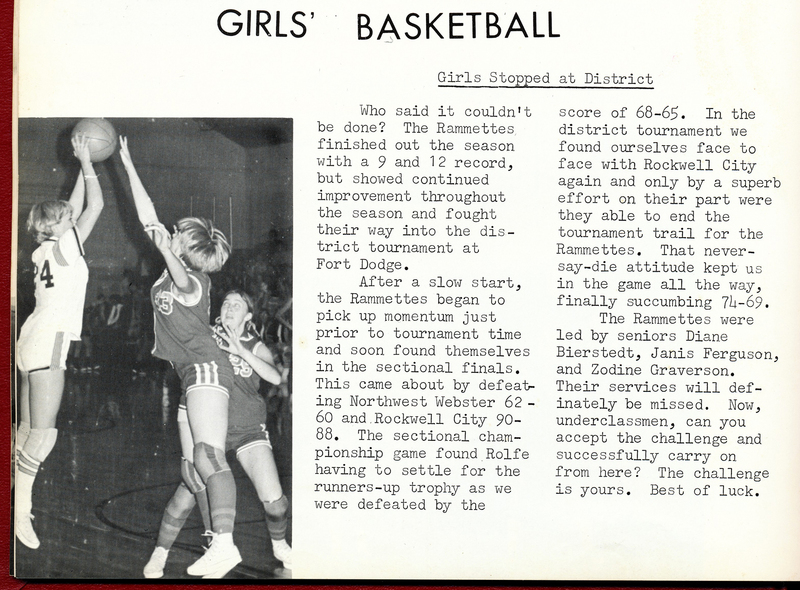 I’ve always thought that a pivotal point for Rolfe girls’ basketball was when Rolfe beat Rockwell City in the 1970 Sectionals. That was when I was a freshman and on the JV team. It was Al Van Houten’s and Dennis Duerling’s first year coaching girls’ basketball at Rolfe. There was a lone freshman on that 1969-70 varsity team: Michele Pomerenke. I remember sitting in the front row of the bleachers on the northwest side of the Rolfe gym during that Rolfe vs Rockwell City game. We fellow freshmen were so excited when Michele was substituted into the game, played in such a feisty manner and was part of that memorable victory. 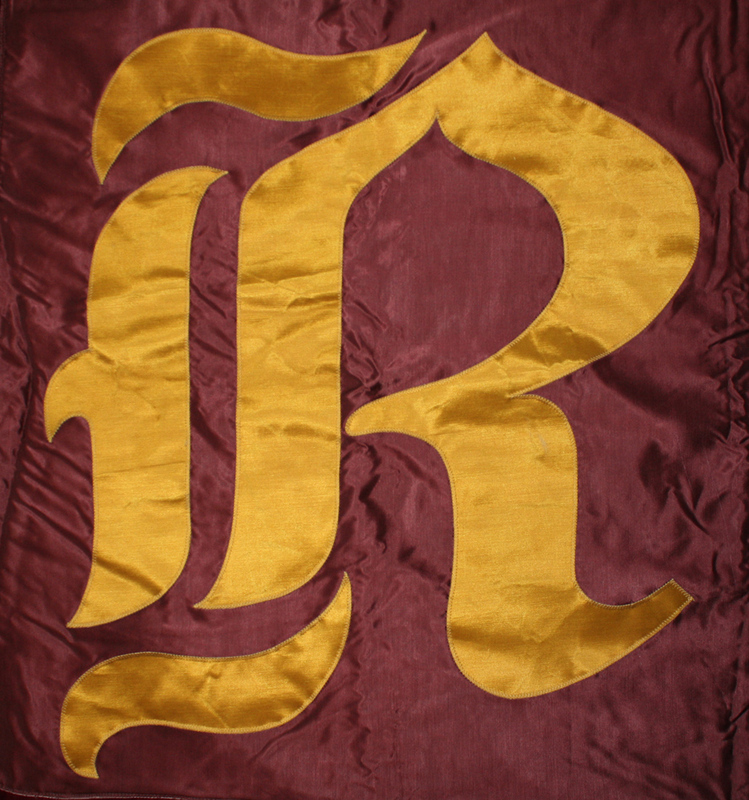 +Designates player or coach from the 1970-71 Rolfe girls’ state tournament basketball team. 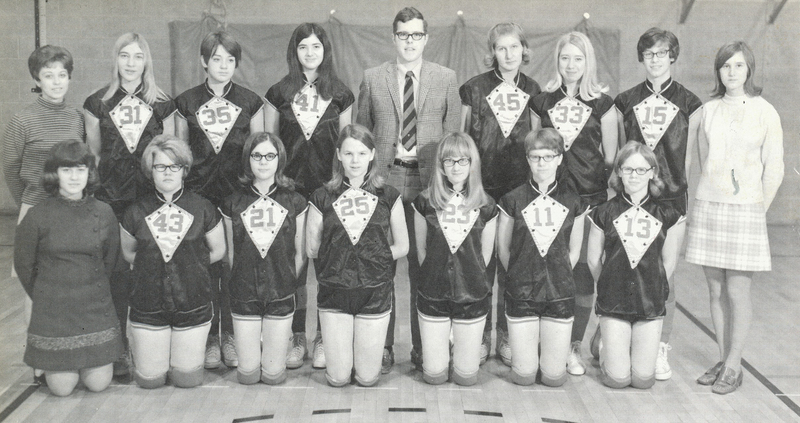 =Designates manager of the 1970-71 Rolfe girls’ state tournament basketball team. This entry was posted on April 6, 2011 at 9:12 am and is filed under Girls' basketball, Iowa, Rolfe. You can follow any responses to this entry through the RSS 2.0 feed. You can skip to the end and leave a response. Pinging is currently not allowed.